"Thrills! Chills! Adventure!" It's here! It's finally here! 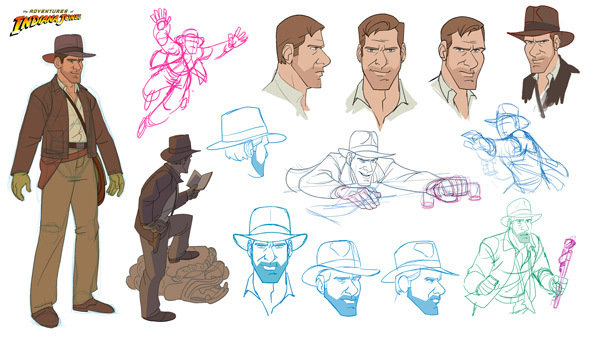 You may have heard buzz, or seen images, from this amazing animated Indiana Jones film that has been in the works for a while from Dutch animator Patrick Schoenmaker. Titled The Adventures of Indiana Jones, this brief "short film" is designed to be an introduction to an Indy animated series (that Patrick hopes to one day create). For now it's just a wonderful 90-second adventure with Indy and Short Round and all his old friends, and it's so much fun. The animation in particular is impressive, and Patrick says it took him a long time to replicate the look of Harrison Ford as Indy. This plays more like the opening intro to the series, instead of one complete story, but I still enjoy it, covering many of his past moments. Here's hoping this inspires more fan-made Indiana Jones adventures. From YouTube: "Famous archaeologist Dr. Indiana Jones is on a quest of a lifetime, but this time he is fully animated in this passion project by life long fan and artist Patrick Schoenmaker." The Adventures of Indiana Jones is both written & directed by animator Patrick Schoenmaker from The Netherlands, with music by Alexander Reumers & Jorrit Kleijnen. Inspired by watching Indiana Jones on VHS as a kid, this is a passion project for Patrick and it took him five years to finish. "I tried to capture the essence of Indiana Jones, both in style and story, hopefully leaving the viewer with a taste for more," he told NY Daily News. You can find more concept art and info about making this short film on Patrick's official website here. Hopefully he makes more of this series soon, as that wasn't enough. For more shorts, click here. Thoughts? Love It and so would my kids. Gofundme account should be set up for this project to make a reality. I'd donate. Disney, or whoever owns Indy rights, MAKE THIS A TELEVISION show now!!! Kingdom of the what now? Music sounds like a mashup of Indiana Jones and Batman: The Animated Series. That theme. Easily one of the best. Makes me smile every damn time I hear it. THIS! THIS IS HOW FRANCHISES FROM THE 80'S NEED TO BE CONTINUED! A MILLION TIMES YES TO THIS!! AWESOME! Also...please do a John Carter animated series please! PLEASE?! ?